We want Atiku back – PDP – Royal Times of Nigeria. 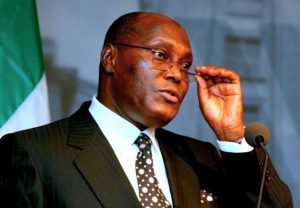 The Adamawa chapter of the People’s Democratic Party (PDP), on Monday said it wants former Vice President Atiku Abubakar to return to the party. The PDP chairman in the state, Abdulrahman Bobboi made this known on Monday while answering questions from journalists during a news conference in Yola. Bobboi said Atiku was being under-utilised in the All Progressives Congress (APC). He said: “Atiku is a founding member of PDP and we want him back; we are not going to give him a breathing space until he comes back as he is currently being under-utilised in APC. “We are going to reach out to him right from his ward to come back to PDP,”.